The incumbent will assist in the strategies leading to confirmed convention and event bookings. 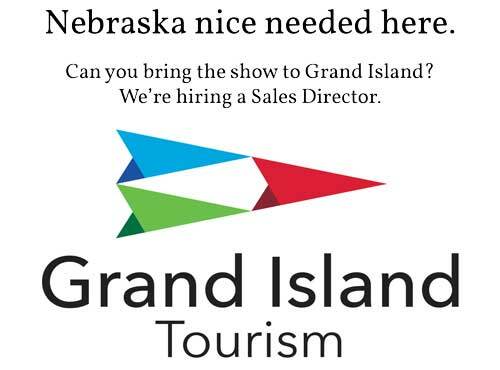 This position will develop and maintain relationships within the Grand Island hospitality community, and represent Grand Island Convention and Visitors Bureau (GICVB) in the regional and national convention market. An incumbent in this position exercises considerable independence in the performance of duties and responsibilities and receives general guidance from their Executive Director. Achieve GICVB sales goals and generates convention and meeting leads for Grand Island area hotels and facilities. Researches and qualifies prospective business opportunities and actively solicits convention and group business in an effort to produce sales leads and secure bookings for hotel/motel properties and facilities. Creates and maintains relationships with the Grand Island area hospitality community. Participates in trade shows, sales trips, site visits, familiarization trips, and local meetings with meeting planners regarding the selection of Grand Island as a meeting site. Conduct Sales calls and meetings with current and prospective clients. Interfaces with convention services team regarding convention clients. Maintains and ensures timely input in GICVB’s customer relationship management (CRM) system. Prepares reports documenting progress toward convention sales goals, historical data, and special requests. Successfully books a predetermined number of room nights and generates a predetermined number of leads. Maintains regular job attendance in accordance with a schedule established for the position by the supervisor. Performs other responsibilities as issued by the CVB director or as the situation dictates within the scope of this classification. Knowledge of attractions, facilities, and services available to visitors in the Grand Island area. Knowledge of the tools and techniques used in the promotion of convention sites and other venues. Ability to give oral presentations to attract representatives of organizations to hold their conventions and meetings in the Grand Island area. Ability to prioritize and manage multiple projects and responsibilities while meeting stringent deadlines. Ability to travel independently via vehicle and/or commercial airlines. Ability to establish and maintain effective working relationships with fellow employees, members of the tourism industry, and members of the general public. Ability to communicate effectively, orally and in writing. Knowledge of business English, spelling, grammar, and punctuation. Ability to sit from 76 to 100% of the time, to stand and walk from 26 to 50% of the time, and reach, bend, stoop, push and pull up to 25% of the time. Ability to use up to thirty (30) pounds of force up to 25% of the time to move objects. Basic knowledge of commercial and/or working agriculture helpful but not required. Must possess a valid motor vehicle operator’s license from the time of appointment. Must be available to work flexible hours, weekends, and holidays. Work is performed in an office setting amid normal conditions of dust, odors, fumes, and noises. However, at times an incumbent is required to travel to other sites within the city and to other cities and in so doing is exposed to all weather conditions. EQUIPMENT OPERATION: (Any one position may not use all of the tools and equipment listed nor do the listed examples comprise all of the tools and equipment that may be used in positions allocated to this classification.